There is a lot of talk right now about developing a vaccine for Ebola. Would you like to be one of the test subjects? Would you purposely expose yourself to a deadly virus to see if some chemical compound would keep you safe? There are some things about vaccines that are not widely known. In 1955 Polio vaccines were found to be infected with a virus, but administered anyway. In 1985 there was a huge increase in breast cancer. Many studies point to that virus. Vaccines are grown in animal by-products. These can even be aborted babies, or aborted animals. They are not screened for diseases. 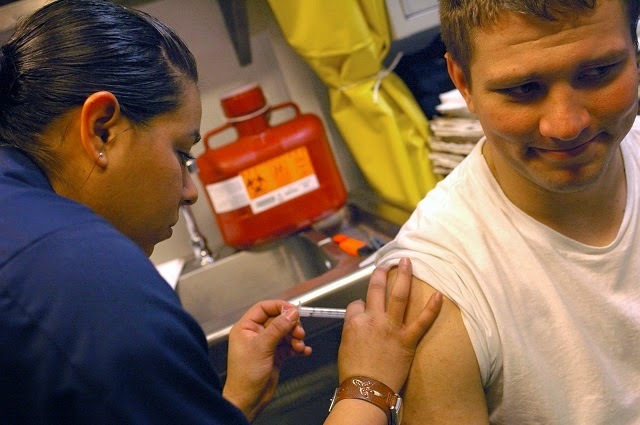 Vaccines have been shown to weaken the immune system. Every vaccine has tissue from aborted babies. Vaccines don’t last, but they do prevent natural immunity. Someone recently vaccinated can spread that disease. Vaccines increase the risk of autism. Doctors and manufacturers are exempt from lawsuits for harm caused by vaccines. Brain inflammation has been recognized as a very serious complication of vaccination since the first vaccine for smallpox. Vaccines have been linked to an increase in peanut allergies. Peanut oil is used in the making of vaccines. Vaccines contain mercury, formaldehyde and aluminum. These are just a few of the known facts about vaccines. Knowing this, would you really want to subject yourself or a loved one to any vaccination, much less one that is being rushed through development, manufacturing and testing? Every time we rush anything, but especially something that has to do with health care, we later find an unknown consequence that could have been avoided. Let’s use some common sense in avoiding people that are sick, or have been around sick people. Take extra precautions with cleanliness every time you touch something that a sick person may have touched. These steps will go a lot farther in protecting us from viruses of all types better than a vaccine.